This film was just released in the theaters in Poland in October 2008 and here in December 2008 the DVD has already been officially released! 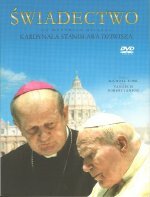 This 98 minute film about the life of Pope John Paul II was a success upon theatrical release in Poland and will soon see release in other countries as well. 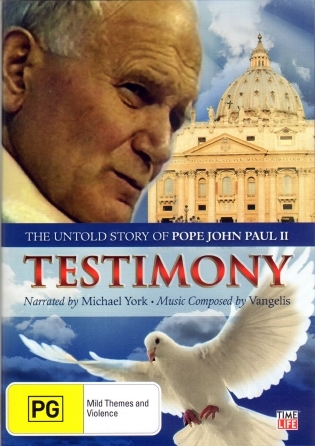 The Polish DVD is dubbed in Polish, although the movie was filmed in English and narrated by Michael York. There is a supplemental "Making Of" and there is also a separate section of music by Vangelis that can be accessed through the menu. This is identified as "Ending Title" but is a combination of the tracks "In Aeternitatem" and "Sanctus", edited seemlessly together. The Polish DVD is housed in a hardbound book-style case with a 34 page booklet. There is a report that this DVD may receive wider release once the film is released in more countries. 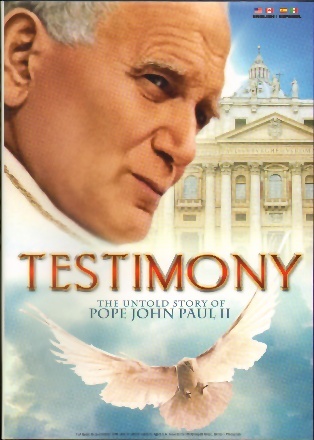 (UPDATE 2009-DVD is now available in the USA! Place your order at the Official Website! )If you do not want to wait, I recommend using the site merlin.pl. These folks accept orders from around the world. The site is in Polish but can easily be navigated by cutting and pasting text and using Poltran to assist with the translation. Merlin also has a Help Page in English. Best of all, there is a Paypal option, so no worries about the security of your purchase! Shipping is fast and best of all, the DVD itself is very affordable! 2008, Dolby 5.1, 16:9, Region 0, PAL, in Polish (no English subtitles-no subtitles at all), 34 page booklet, DVD housed in a hard-bound book. In slipcase.